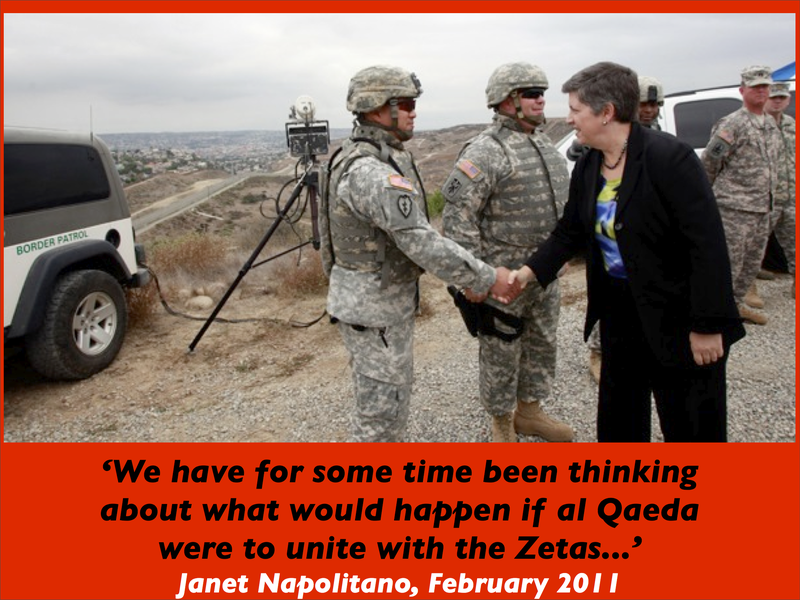 The US/Mexico borderlands was one of the sites I discussed in ‘The everywhere war’ (see DOWNLOADS tab), along with the Afghanistan/Pakistan borderlands and cyberspace. It’s also another zone where the blurring of policing and military operations is highly visible. The Washington Office on Latin America, an NGO ‘promoting human rights, democracy and social justice’ founded in response to the military coup in Chile in 1973, has a fact-checking blog on the securitization of the border, and this year published Beyond the Border Buildup: Security and migrants along the US Mexico border. 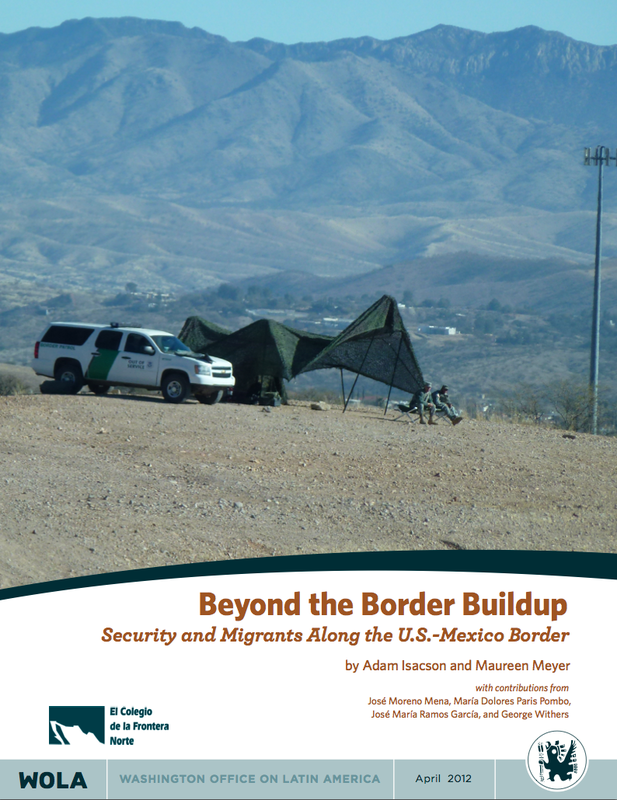 The study finds a dramatic buildup of U.S. security forces along the southern border – a fivefold increase of the Border Patrol in the last decade, an unusual new role for U.S. soldiers on U.S. soil, drones and other high-tech surveillance, plus hundreds of miles of completed fencing – without a clear impact on security. For instance, the study finds that despite the security buildup, more drugs are crossing than ever before. Furthermore, the study reveals that security policies that were designed to combat terrorism and drug trafficking are causing a humanitarian crisis and putting migrants in increasing danger. Migrants are often subject to abuse and mistreatment while in U.S. custody, and face higher risks of death in the desert than in previous years. Also, certain deportation practices put migrants at risk. For example, migrants can be deported at night and/or to cities hundreds of miles from where they were detained. These same cities are also some of the border region’s most dangerous, where migrants may fall prey to – or be recruited by – criminal groups. In Mexico, approximately 20,000 migrants are kidnapped a year; many others face other abuses. WOLA found that any further increase in the security buildup will yield diminishing returns. Contrary to common opinion, the report documents a sharp drop in migrant crossings. Since 2005, the number of migrants apprehended by the Border Patrol has plummeted by 61 percent, to levels not seen since Richard Nixon was president. Today, twenty migrants are apprehended per border patrol agent per year, down from 300 per agent per year in 1992. Finally, the study finds that violence in Mexico is not spilling over to the U.S. side of the border. U.S. border cities experience fewer violent crimes than the national average, or even the averages of the border states. WOLA recommends that before making further investments in border security, the U.S. government should stop and take stock of what is and isn’t working in order to create a comprehensive strategy that takes addresses the real threats while respecting the human rights of migrants. Then I turn to the pages of the latest Military Review, where Christopher Martinez elaborates on Mexico’s transnational criminal organisations – the drug cartels – as constituting a commercial insurgency: ‘They seek to influence the four primary elements of national power — the economy, politics, the military, and the information media — to form an environment that enables an illicit trafficking industry to thrive and operate with impunity.’ Martinez is not the first, and he certainly won’t be the last, to describe Mexico’s militarized ‘war on drugs’ in terms of insurgency and counterinsurgency and, as I showed in ‘The everywhere war’, this rhetoric slides easily into the armature of a ‘border war’ in which the United States is fully invested as part of its boundless ‘war on terror’. While providing the much needed support to the nation’s law enforcement agencies, the JTF North support operations provide the volunteer units with real-world training opportunities that are directly related to their go-to-war missions. “This type of experience is impossible to replicate in a five- or 10-day field exercise back home,” said Lt. Col. Kevin Jacobi, squadron commander. “Where else can we operate over an extended period of time, in an extended operating environment, against a thinking foe who is actively trying to counter us by actively trying to hide, in order to make us work hard to find him?” asked Jacobi. This entry was posted in borderlands, counterinsurgency, Mexico, police, security and tagged cartels, Joint Task Force-North, Mark Neocleous by Derek Gregory. Bookmark the permalink.